Andrew Dalhouse’s colors worked well throughout, but the opening Joker pages really popped for me. Most of Brett Booth’s art was also really great, but I’m torn on his Daffy. On the one hand, it genuinely worked. 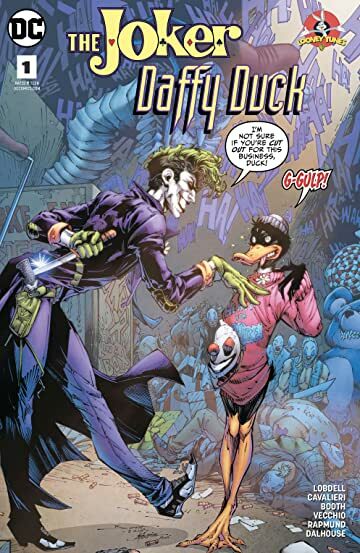 On the other hand, I hate that he had to give him the Howard the Duck treatment in order to make it work. It’s a one-shot, with a backup story, so the story moves at that breakneck pace that a good Looney Tunes story should move at, with basically everything past page 4 being kinda spoiler-esque. The second story, “Silence of the Lame” was closer to what I thought I wanted when this hit my desk. But after being so entertained by the first story this one felt lacking. Taking place in a more cartoonish Gotham (but not full on Batman Adventures cartoonish), Joey Cavalieri manages to write a story packed full of gags, and ending on a perfectly ridiculous ending. Meanwhile, Luciano Vecchio’s art was the perfect blend of the source material for this tale. If you are looking for a dark, brooding, Batman story you’re going to be disappointed. If you’re looking for a fun, Looney, romp through Gotham, you’ll love it. I’m still a bit surprised to see myself say this, but I’m giving this 4 out of 5.